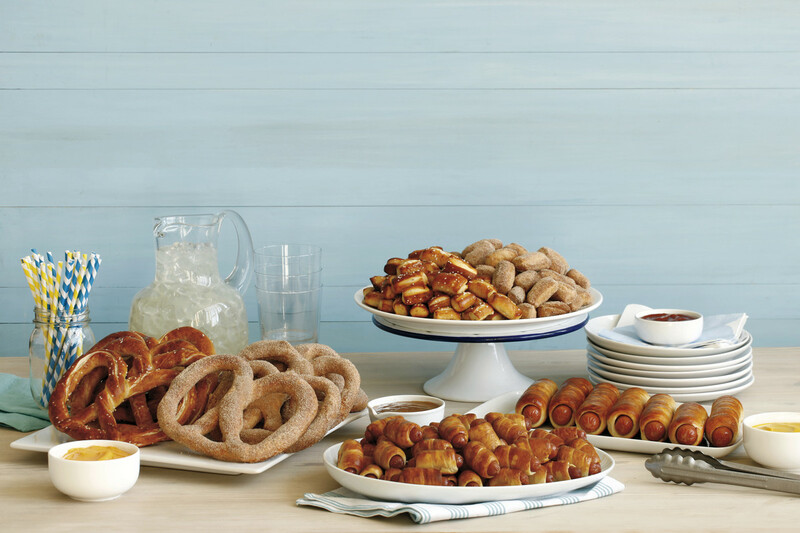 When Anne Beiler baked her first pretzels in a Pennsylvania farmer’s market, she wanted to create a great product and provide people with an amazing experience. After some experimentation, “Auntie” Anne created a masterpiece. Customers kept coming back and asking for “the best pretzel they had ever tasted”. People wanted more. They asked for the secret recipe so they could have soft, delicious pretzels and drinks wherever they were. As a response, Anne and her husband looked for new ways to expand and bring the taste of Auntie Anne’s to the world. After the initial stand in 1988, the first franchise opened in 1989 in Middletown, Pennsylvania. By 1992 they had 100! They opened the first oversees store in Indonesia in 1995. In 2003 the brand first came to the UK with the first store in Cheltenham. 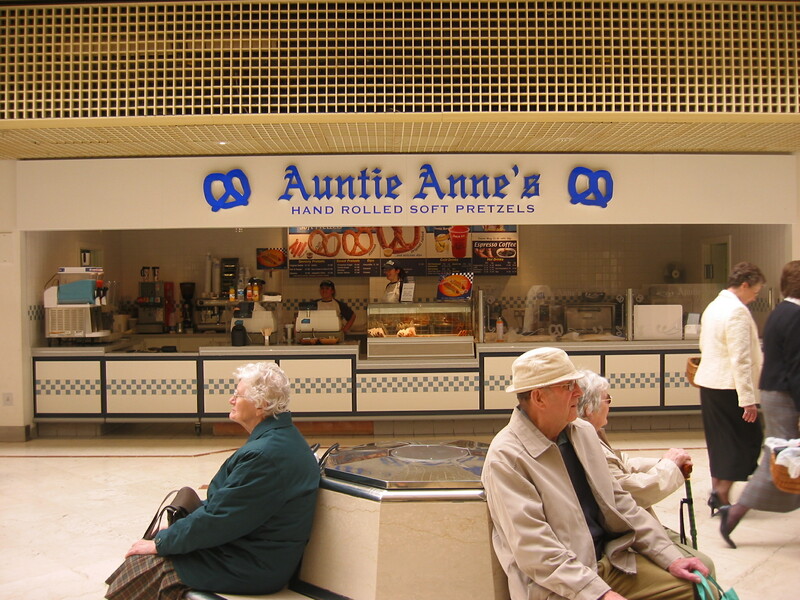 The Auntie Anne’s Master Franchise was bought by its current owners, Freshly Baked Limited, in 2008. In 2005, the original founders, Anne and her husband, sold Auntie Anne’s in order to fully devote themselves to their original vision of opening a family-counselling centre. In 2009 the brand celebrated the 1000th store opening and by 2010 Auntie Anne’s joined the Focus Brands portfolio. 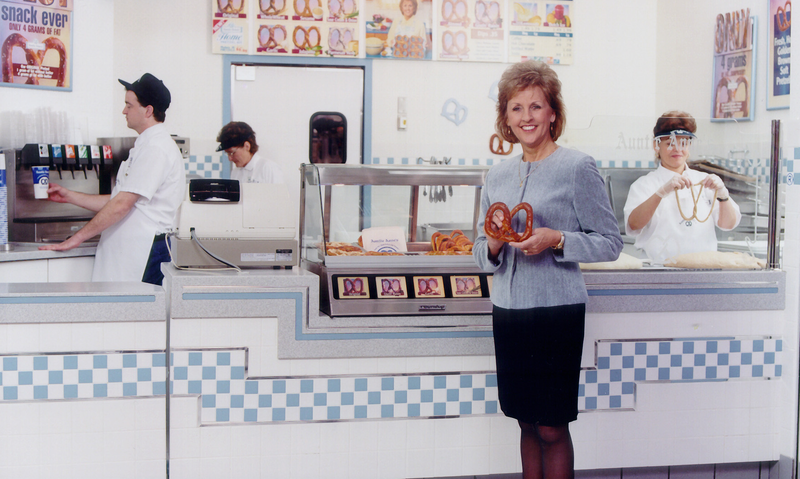 In 2018 we celebrated 30 years of Auntie Anne’s with around 1800 stores globally. We celebrated 10 years of our ownership of Auntie Anne’s in the UK and Ireland, by the end of the year we will have 40 sites across the UK and Ireland. Our long and rich history using the franchise model shows we have sustainable business model. The UK Head Office team contain all the skillsets to not only support you but also show you the ways to run a profitable business. Freshly Baked Limited, UK Master Franchisee, is owned and operated by the Directors of the business who combined have over 50 years’ experience in franchising. Our Chairman is the ex-owner of the Thrifty Car Rental business growing the business by tenfold in the years he was managing it and its 200 staff. Our operations team contains ex food and beverage brand managers and franchisees who know how to professionally run a food business, plus a full support team for administration, marketing and finance. Our network is supported by a one stop shop supply chain who facilitate all of our stores and products. This means all your ordering is done through an online website where your food products, packaging, cleaning products and smallwares can be ordered in a single place at competitive commercial rates. Auntie Anne’s worldwide is owned by Focus Brands Inc based in Atlanta USA, owner and operator of seven global food brands - over 6000 retail bakeries, cafes, restaurants and ice cream shops. Focus Brands are a leading developer of global, multi-channel food service brands and the international team has taken 40 different brands to over 60 countries. They support their brands in a number of ways including operational best practices, research and innovation and professional marketing assets and campaigns. Every franchisee must complete a thorough training course which takes place at the Head Office and in your store once built. This course takes you through various stages including operations training (all our pretzels are handmade on site, nothing pre-made or frozen at Auntie Anne’s! ), marketing, HR and general business practices. It is key that all of our franchisees are trained to the same level to ensure a consistent and uniform brand. 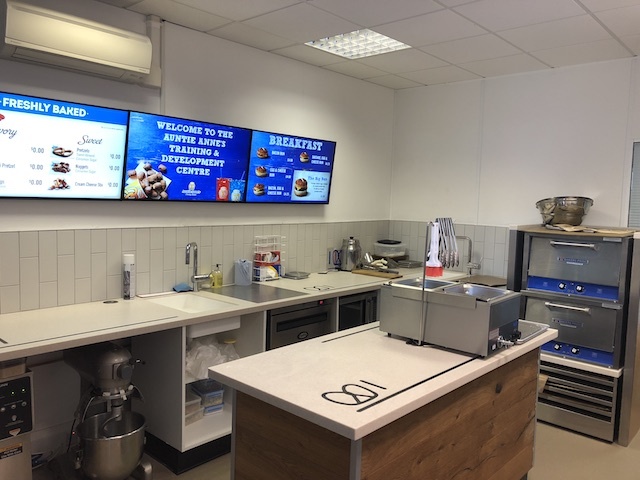 We have a fully equipped training kitchen in our Head Office meaning your pretzel rolling skills will be perfected by the time your store is ready to open! Our product is our differentiator. Every single Auntie Anne’s Pretzel is made from scratch on site and is sold within 30 minutes of coming out of the oven. This guarantee allows us to be very confident in the product. We are extremely passionate about our product, it’s what drives our franchisees to push harder and keeps customers returning. Because we make our dough from scratch, the range of products we can create is endless. We are constantly developing and evolving new products. We get ideas from industry trends, franchisee ideas, products from other Auntie Anne’s markets and also products from Focus Brands. We sit in the ‘Grab & Go’ sector, but this does not just mean snacks. We have a full breakfast bun range, pretzel sandwich concept in development, ‘snack as meal’ products that make for a filling lunch or early dinner as well as all the classic Auntie Anne’s products that can be enjoyed at any time of the day. 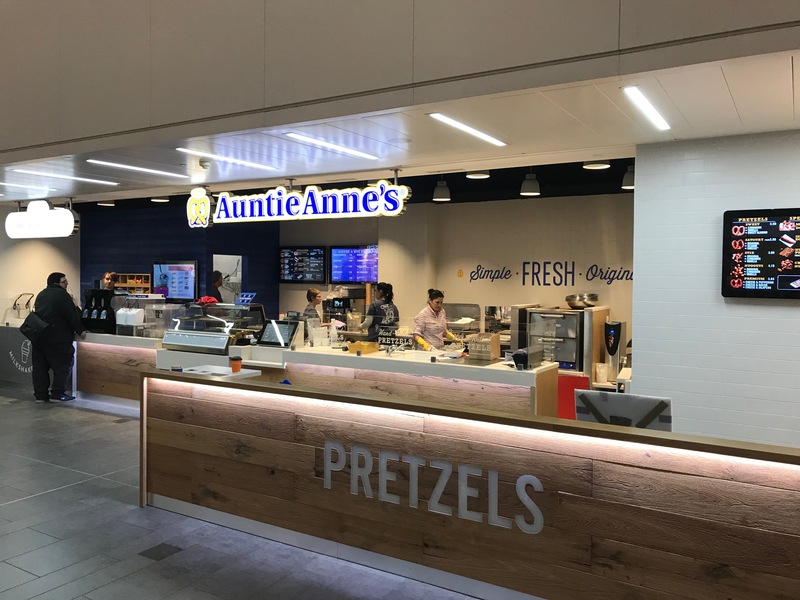 Auntie Anne’s at its core in a relatively simple, hands on bakery business where the product is king, providing entrepreneurs an opportunity to make a good return on investment whilst enjoying the job they do. Auntie Anne’s are transparent in dealing with both franchisees and their customers, which is important to me. The fact that both the company and the product it sells are good makes owning an Auntie Anne’s franchise a win/win situation. Since the training I have been in constant contact with the UK based support team, who are excellent. Apart from the fact that I am running a successful and profitable business, what I enjoy the most about owning my franchise is seeing the reaction on new customers faces when they bite into an Auntie Anne’s pretzel for the first time. My lifestyle has improved in the sense that I am now doing something that I really enjoy.